D on’t believe anyone who says that LA doesn’t have great pizza. While we may not be the meccas that NY or Chicago are, there are plenty of fantastic pies in this town, whether you’re after authentic deep dish, Roman-style thin crust, or something altogether new and exciting. 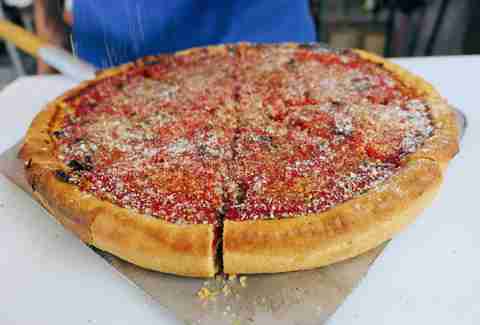 As proof, here’s our list of the most essential spots to get the best slices and pies in town. 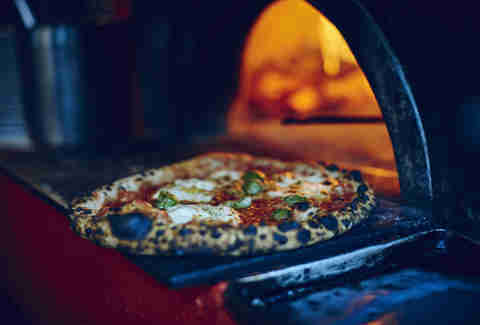 Maybe you’ve never gotten to the pizza, because everything else at Sotto is so good. It’s OK, we forgive you. 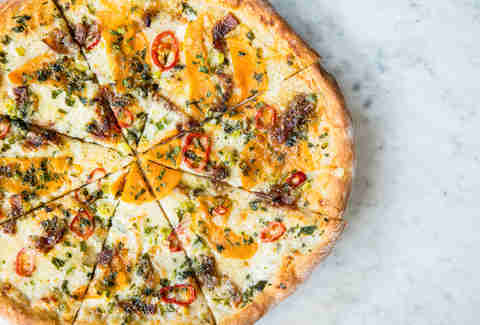 But now that you’re older, wiser, and more poised, you should have no trouble marching into Sotto and proudly ordering the Guanciale: a powerhouse of house-cured pork cheek, ricotta, scallions, and fennel pollen. Congratulations on your life choices! 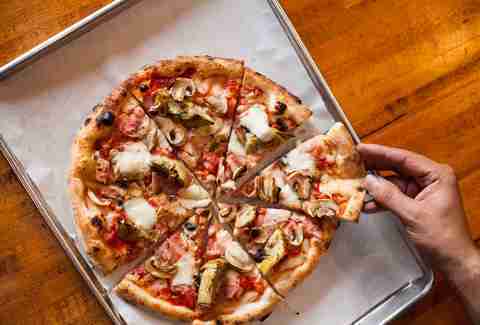 This fast-casual mini-chain has become such a standby, it's easy to forget that Pitfire makes pies with the perfect ratio of toppings-to-cheese-to-crust, and its wood-burning oven and chill attitude have inspired a slew of almost-equally-awesome establishments. It’s also got great seasonal pies and an impressive beer selection, which means you’re gonna keep going back -- not that that’s a bad thing. This New Yorkian mini-chain seemed like just another pizzeria when it opened, but Tomato Pie has won over people hand-over-dough-filled-fist with its traditional grandma pie, essentially a thin-crusted margherita that's perfectly, zestily sauced. This fast-service, quick-turnaround, conveyor belt-style pizzeria was hyped heavily when it opened, for two reasons: being a concept from the dudes behind Umami, and an oven that cooks your pie in under two minutes. Well, the hype was deserved: The pies here are satisfying, not just because of the perfectly cooked crusts, but because they're individually customizable with top-grade ingredients ranging from fresh mozz, to house-made pesto, to squash blossoms, all of which can be combined in any combo you choose (or, if you follow 800 Degrees on social media, in an ever-changing $5 pizza of the day). Boom. This spot from the people behind local favorite Cube, in the former location of local favorite Cube, opened quietly in 2015 almost as an afterthought. Here’s the thing, though: The pizza is way, way better than it should be -- perfectly chewy and crispy, and covered in excellent, imported ingredients that make the whole thing... well, better than Cube. We said it, and we mean it, especially because you can (and should) get the famous Cube fried chicken as well (to share, obviously, since you also are definitely eating pizza). 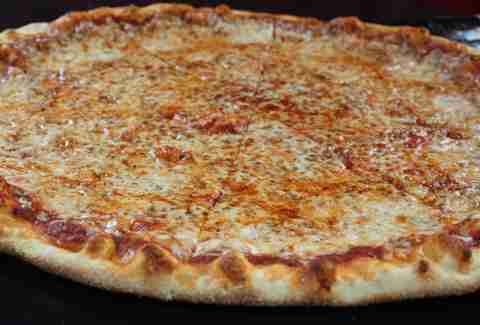 Ask anyone who grew up in LA to name the pizza that makes them nostalgic for childhood, and they'll drop one of two answers: the XXXXXXL slices at Greco's (which, once you're grown, are only great if you're about seven sheets to the wind), and the floppy pies from Mulberry Street. Their flaptacular crusts are a bit of an acquired taste, but their toppings are absolutely delicious. When Nancy Silverton and Mario Batali opened this now-legendary pizzeria, they did what others had deemed impossible: They made LA pizza a talking point of the city. 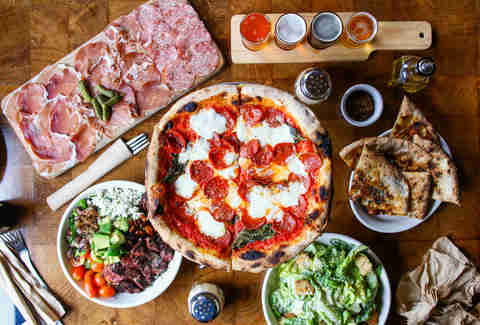 No list of the best pizza in LA would be complete without this place, thanks in no small part to the perfectly bubbly, perfectly chewy, perfectly charred crust, and ingredients that pop on your palate, whether they’re clams, squash blossoms, or sausages. Man, we’re hungry. It’s nuts that DeSano isn’t 1,000 times more famous: The large, sit-down pizza shop imports its ingredients straight from Italy, and you can taste it when you bite into any of its masterpieces, like the capricciosa (San Marzano tomato sauce, mushrooms, artichokes, prosciutto, garlic, scamorza, mozzarella di bufala, and pecorino romano) or the Verdura (broccoli rabe, mushrooms, Vesuvian cherry tomatoes, garlic scamorza, mozzarella di bufala, and pecorino romano). The also-imported gelato is just icing. Anybody who has tasted the pasta at this beloved K-Town Italian gem won’t be surprised to hear that the pizza is equally as outstanding. If you’re not too full from the complimentary breadsticks, peruse its large pizza menu, and fear not -- you can’t go wrong. Especially with its Frutti di Mare, with tomato, mozzarella, calamari, shrimp, and clams. There’s no place in LA where Italian and Bayou flavors clash so beautifully as this NY import. This is especially evident when you’re dealing with the Bayou Beast, a wondrous monstrosity of spiced shrimp, crawfish, andouille, jalapeños, and mozzarella. Wondering where the chain’s name came from? Hint: Italy and Louisiana share a pretty similar shape. 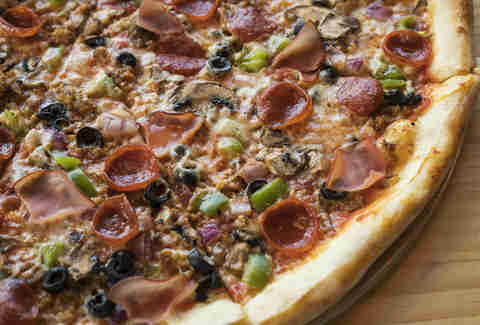 Though it started as a covert operation run out of an alley, Hollywood Pies has established itself as a pizza heavy-hitter, thanks to what many ex-pats call the only true Chicago-style deep-dish in the city. And heavy-hitter is right: One slice of these multi-layered monstrosities, and you'll have to take a nap. 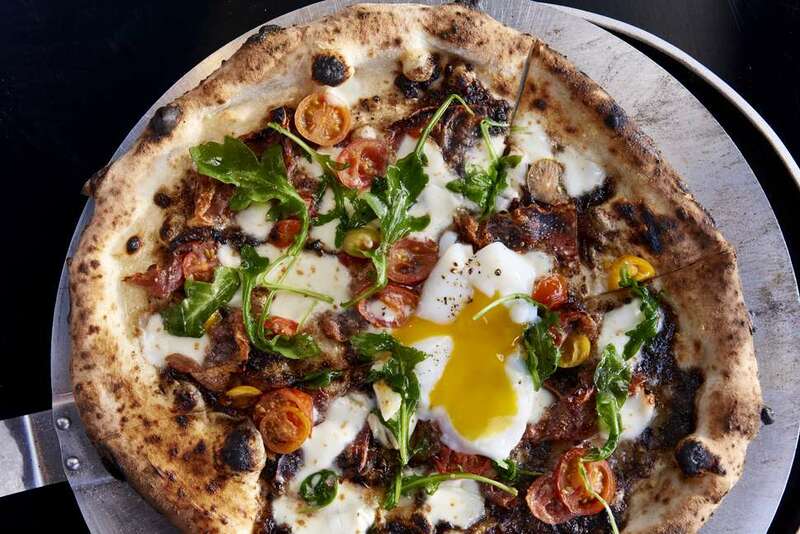 Bestia might just be the best restaurant in LA (seriously, it hasn’t left our Eat Seeker list since the list started), and -- once you actually get a reservation -- it’d be a travesty to ignore its insanely tasty artisan pizzas. All of them are great, but you might actually freak out when you taste the Alla’nduja: a perfectly blackened, doughy valley full of San Marzano tomatoes, mozzarella, black cabbage, fennel pollen, and the house-made spicy ‘nduja (aka a spreadable Calabrian pork salume). If you’re gonna call yourself “NY pizza,” you’d better be prepared to back it up, as New Yorkers living in LA will be your most merciless reviewers. Lucky for Santino’s, hordes of ex-pats give it up for the authenticity of these square or round (your choice!) pies, which are something of a local secret... er, were something of a local secret. Sorry. 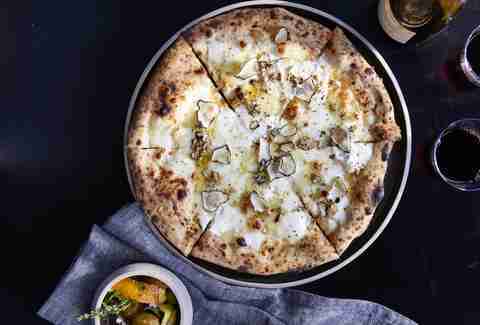 Every pizzeria does a mushroom pizza, but none of them are slicing up anything like Stella Barra’s: The Shaved Mushroom pie is served with a Parmesan cream sauce, Gruyere, melted onion, truffle oil, rosemary, and parsley. That, plus its Hollywood location, means that when you’re going to a movie at ArcLight, your meal choice has already been made for you. Just save room for the cookies: Stella’s are the best in the city. Period. Forget about the notoriously bad service at this Westside standby and just concentrate on the pizzas, because every single one of them will knock your socks off -- and you might even get some other clothes knocked off if you go with the bottarga with jalapeño pizza, a pie laden with tomato confit, asiago, smoked mozzarella, lemon juice, olive oil, arugula, and topped with bottarga (cured fish roe). If Jon & Vinny’s is too far west for you, and you want breakfast pizza, here’s the less-drivey alternative: the Los Feliz favorite’s morning option is topped with speck, mozzarella, tomato sauce, and of course, a sunny-side-up egg for maximum #yolkporn Instagramming. Pizza doesn’t have to be for lunch and dinner, at least, not when Jon Shook and Vinny Dotolo (yeah, the dudes from Animal & Son of a Gun) are in charge. 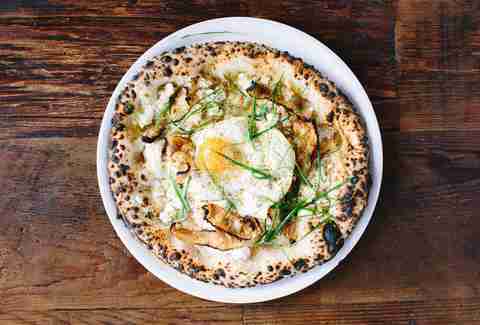 Its breakfast pie is the menu all star: It’s topped with Zuckerman Yukon gold potato, egg, rosemary, olive oil, Parmesan, and red onion, with a perfectly runny egg right in the middle of it. The ratios are absolutely spot-on, and the pizza’s even better if you add Niman Ranch bacon. Obviously. 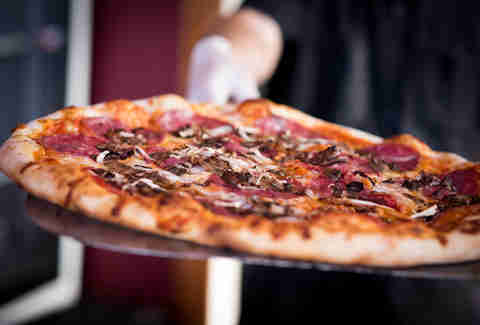 Though LA’s pizza scene is obviously on point, it’s still sometimes difficult to actually get only a slice. Prime is here to help, doing everything from customizable slices, to full pies, to sandwiches & salads. Whatever you end up with, you’ll want to complement it by getting heavily involved with those garlic knots -- they’re so good, in fact, that it just might be the pizza doing the complementing here. Whether you’re dealing with the pizza quality or the actual shape of said pizza, no corners are cut at Barone’s, which has been serving up thin-crust, rectangular, Neapolitan-style slices since 1945. Despite a location change in the middle of its illustrious life, Valley regulars and first-timers alike swear by Barone’s. We’re among them. 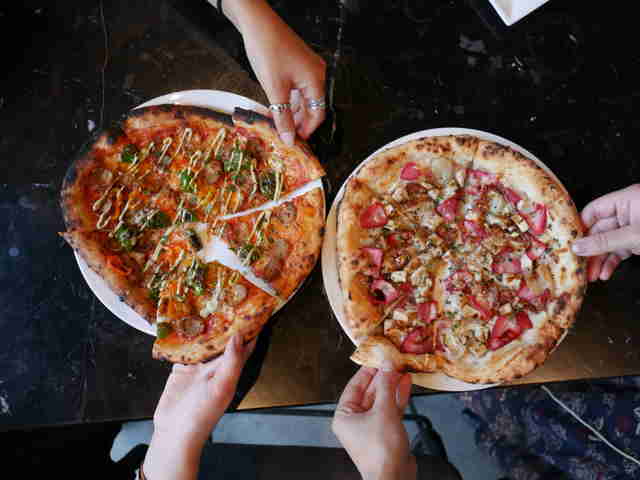 We’re not sure when East Hollywood became the new place to be for pizza, but that’s what seems to be happening and we sure aren’t complaining. The portions here are gigantic, the staff are friendly, the vibe is lively, and most importantly, the pizza is always a home run. We know how hard it is for New Yorkers to give the seal of approval, and yep, Gracie's has it. 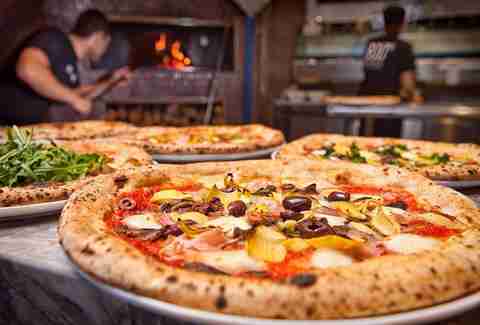 This Venice hotspot is a mecca for anybody who appreciates pizza -- even an eastsider will make the trip. South End’s dough is handmade daily, and on it you'll find delicious treats like The Boardwalk (Roma tomatoes, mozzarella, Sottocenere, speck, mushrooms, egg & arugula) or one of our favorites, The Trolleyway (mozzarella, ricotta, sottocenere, fiore sardo, black truffle sea-salt & arugula). Don't shrug the bar program either; you'll find a ton of wines by the glass, along with tasty craft cocktails. 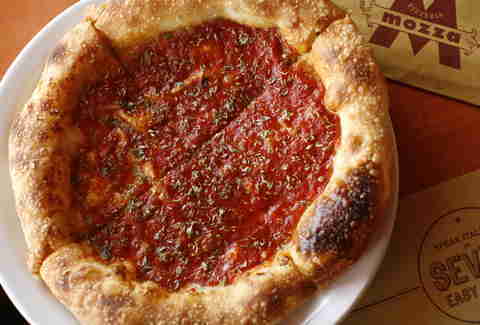 Yet another Chicagoan-approved deep-dish spot, Dough Box has become an east side cult favorite. The place does personal deep dishes too, so bring your appetite 'cause sharing doesn't always have to mean caring. Not a deep-dish person? 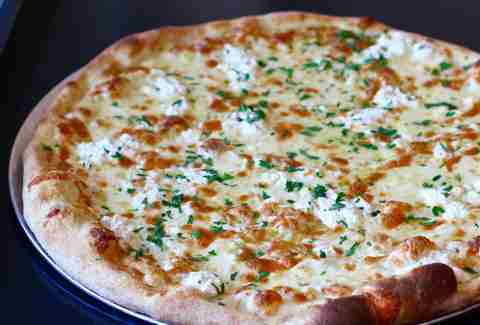 Weird, but Dough Box does make a specialty thin-crust margherita pie every Wednesday, so you’re in luck. Little Tokyo's best not-Asian-food outpost is one of DTLA's gems, serving up small plates, craft cocktails, and a great beer selection. You’re gonna want to focus on the pizzas though, particularly the charred octopus (with caramelized cipollini and radicchio cream sauce), or the Sweet Mary (with chicken breast, strawberries, fontina, smoked bacon, and aged balsamic). 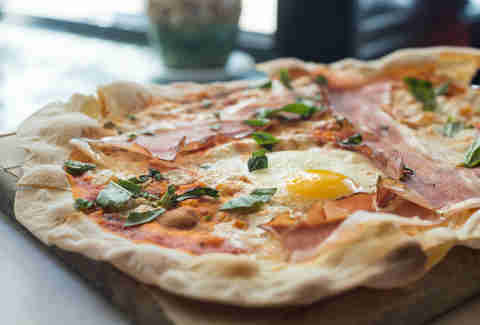 If you’re looking to conduct some business with the new pre-fixe bottomless brunch menu ($30 for an entree, side, and bottomless rosé or mimosas), the pizzas count as an entree. “Vegan pizza” might be a turn-off, but we have two things to say to you: 1) there are some non-vegan options, and 2) the vegan stuff’s actually damn good. If you’ve blown off any pizza recommendations from Echo Park’s best spot for craft beer, time to make an adjustment. Add meat if you want, but do us a favor and give the vegan cheese a shot -- we’re willing to bet you wouldn’t even know it’s vegan. 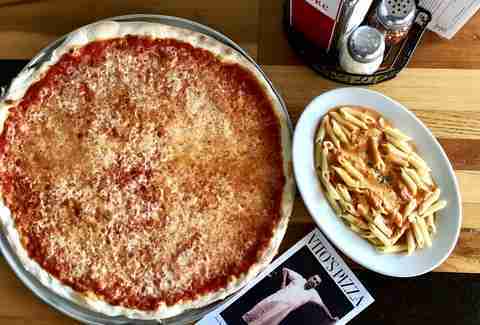 The LA Times called Vito’s the best cheese slice in town, and we’re not exactly ready to disagree. The pizzas are simple and the ingredient quality shines in each and every piece (the White Pie is a sleeper hit). Thank you, dearest Vito. Thank you. It’s easy to write Pizzana off, knowing the famous cupcake team is behind it, but it’s 2017 and it’s time to have an open mind. The mozzarella is shipped straight from Italy, the pepperoni curl up at the edges the way you want them to, and the crust is perfectly charred. Not really much else to say... Pizzana is a winner. 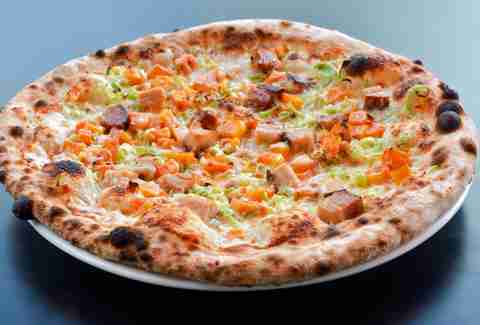 You’d be hard-pressed to find fans defending pizza the way Grimaldi fans do it. The brick-oven, thin crust pizzas are expertly proportioned, well-sauced-and-cheesed, and pretty much all the other check marks you need to hit for great pizza. The chopped salad and cheesecake ain’t too bad, either. Jeff Miller is trying to get out of pizza, but it keeps pulling him back in. He's on Instagram at @jeffmillerla and Twitter at @ThrillistLA. Wilder Shaw is a regular Thrillist contributor who will eat pizza at any time of day. See for yourself on Instagram at @wildershaw and Twitter at @WilderShaw_.